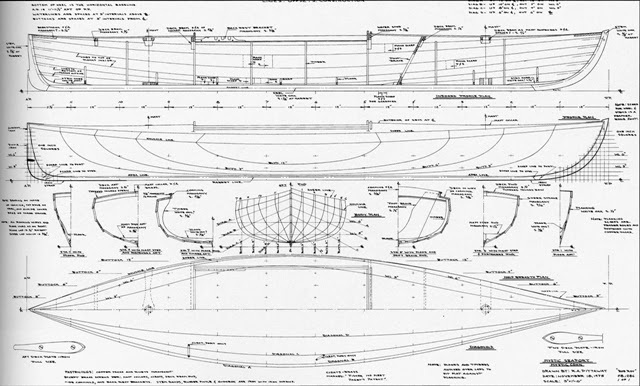 In Search of an Australian Plan: Looking for plans of one of McGregor’s original Rob Roy canoes. Excited to learn about kayaking as a teenager I was soon told the sport of kayaking in UK had begun with John McGregor and his Rob Roy Canoe. Actually that’s not entirely true. I actually learned he was the founder of the sport of canoeing in Britain. Inspired by canoes and kayaks he had seen during visits to North America and Kamchatka in the late 1850s John McGregor commissioned a boat to be built by Searle & Co. Thames River boat builders in his then home town London, England. This was the first and the longest of a series of boats of similar concept he commissioned. He named it the “Rob Roy”. It served him for his first series of journeys recounted in his book “A Thousand Miles in a Rob Roy Canoe”, published in 1866. McGregor’s book became very popular, spurring him on to enjoy further travels in Europe, the Baltic, and in the Middle East, and to write more books. He also took time to explore around Shetland and Orkney. He typically had a new boat built for each new adventure, so he must have commissioned at least 5 boats. The first measured 15 feet in length with a 32-inch long cockpit but later “Rob Roys” were built shorter to 14 feet, then 12 feet, and the cockpits longer to allow him to lie down and sleep inside. The shorter kayak length made for easier transport and handling. Their solid construction with an oak-planked hull and keel and mahogany deck made them fairly heavy, so bringing the length down to 12 feet reduced the weight to less than 75 pounds unladen. In appearance the Rob Roy was double-ended like a canoe or kayak, with a deck fore and aft. When not sailed it was propelled by a double-bladed paddle. 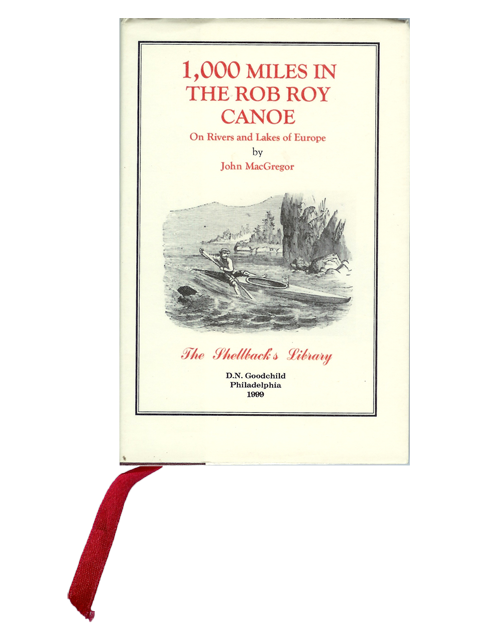 McGregor's book 1,000 miles in a Rob Roy Canoe. McGregor’s kayak travels inspired others. The writer Robert Louis Stevenson journeyed in Belgium and France in a Rob Roy in 1876 and wrote a book about the journey, “An Inland Voyage”, published in 1878. Warrington Baden-Powell took a Baltic cruise in 1871 visiting Germany, Denmark and Sweden and published the book “Canoe Travelling: Log of a Cruise on the Baltic, and practical hints on the building and fitting of canoes.” (Warrington headed the Sea Scout branch of the Boy Scout movement that his younger brother later founded.) The American Poultney Bigelow was inspired by McGregor’s books to paddle down the entire length of the Danube from the Black Forest to the Black Sea with a couple of companions, publishing the book “Down the Danube” in 1892, helping bring the Rob Roy mentality to USA. 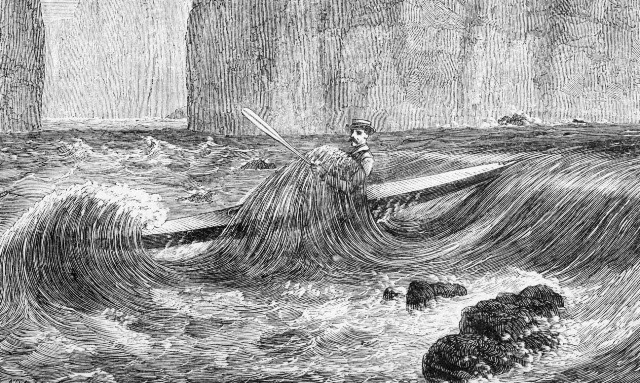 The boom in Rob Roy interest, fanned by the books and presentations by those who made the longer journeys, led to the popularization of recreational "canoeing", as the UK kayaking scene was from then on confusingly referred to. It was during this explosion of interest in canoeing that Frederick Charles Benfield Fairey became interested in the Rob Roy. Born in Brighton England October 17th 1844, Frederick left home at age 15. He spent some years at sea, migrated to South America, then in 1876 moved to Australia to a town called St Kilda near Melbourne, to become a church minister. St Kilda is just down the road from Brighton and Black Rock, named for the English south coast childhood home towns of both Fairey and myself. Fairey, a keen boater, decided a boat would offer the ideal way for him to visit and preach to people in the more distant parts of his territory. Having read some of McGregor's exploits he contacted him in London. McGregor arranged for a Rob Roy to be built for Fairey by Searle and Company and shipped to Australia. It was to be a replica of his own #5 Rob Roy, the one he used in Orkney and Shetland. When it arrived the following year he named it the Evangelist and tested it on local waters. He began with a 100-mile voyage. This took him around the west shore of Port Phillip, portaging into the Barwon River to follow the watercourse to Barwon Heads and Bass Strait. 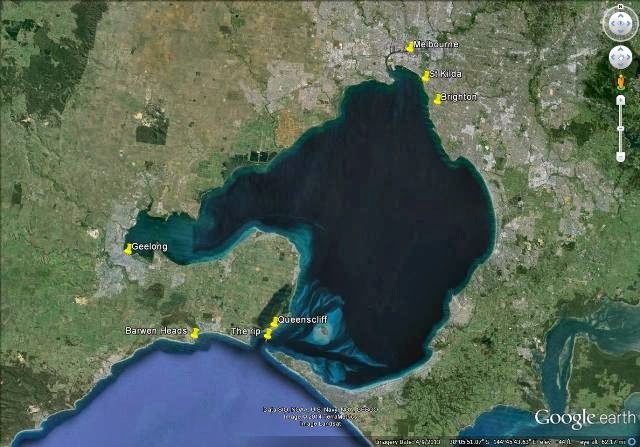 From there he followed the open coast to the “rips” to re-enter Port Phillip and follow the west coast back home. After Fairey moved to the north of Tasmania in 1877, he used the Evangelist to explore the north coast, and also paddled and sailed from there to Hobart down the east coast. You can read his account here. When 2 years later Fairey moved from Tasmania to Windsor in New South Wales, Australia, he continued to use the Evangelist on the Hawkesbury River. I visited Melbourne in 2013 and was wonderfully hosted at Black Rock by kayakers David Golightly and Heather Torbet. David is fascinated by local history and hailing from Scotland was enthusiastic about this local kayaking milestone that had direct Scottish associations. Hear a podcast of David talking about Fairey here. Barwon Heads has seen the start of two of the three kayak circumnavigations of Australia. 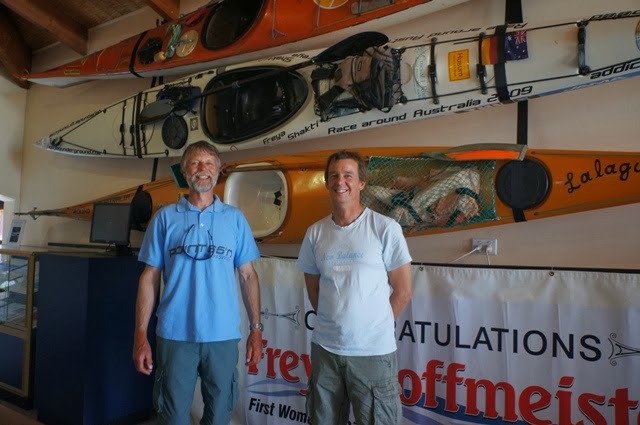 The museum there displays the kayaks of Earl Bloomfield (first kayak circumnavigation of Tasmania 1979), Paul Caffyn (first kayak circumnavigation of Australia 1981) and Freya Hoffmeister (Second kayak circumnavigation of Australia, 2009). Stuart Trueman who completed the third kayak circumnavigation in 2011 started at Broome on the west coast. Perhaps in the future his kayak could be exhibited alongside the others. A plaque at Barwon Heads commemorates Paul Caffyn’s 1981 achievement, but it was more than 100 years earlier Fairey kayaked passed by on his first trip. 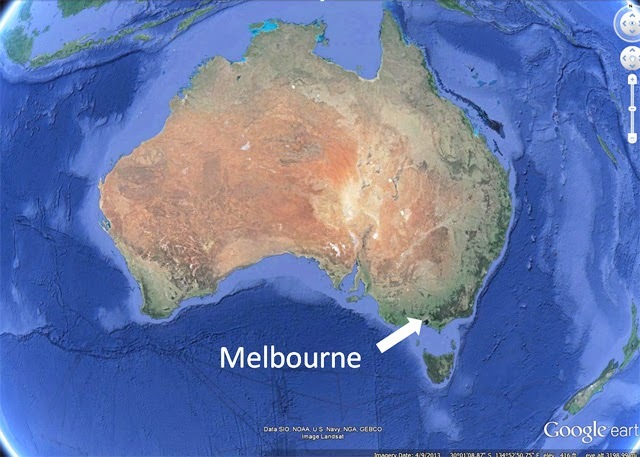 That trip probably marks the starting point for Australian kayaking. A significant milestone in its own right! As the first journey was made in a direct copy of one of the kayaks commissioned by the John McGregor, who was born in Scotland, there is a nice Scottish connection for David, who reenacted Fairey’s journey with more than 20 members of the Victorian Sea Kayak Club in 2008. When David told me about Fairey, he was already an authority on him. But he wanted to learn more. I enjoy sleuthing for information so I agreed to help if I could. But I had discovered additional reasons to be curious. Like Fairey, I was brought up in Brighton England, was drawn to kayaking, and we shared the same birthday. I introduced David by e-mail to Elizabeth, my mother, who loves historical research, and was delighted to be able to dig up census details from an early point in Fairey’s life, when he lived in Western Road Brighton, England. David was also looking for original Rob Roy plans and with the assistance of my friends in UK and USA I finally found the missing links. The version of Rob Roy that Fairey bought was a direct copy of the one McGregor used on his 1872 explorations around Orkney and Shetland. That was Rob Roy #5. This version, having the slightly longer cockpit than McGregor’s earliest models, meant Fairey was able to drag it ashore, set up a canopy and sleep inside. 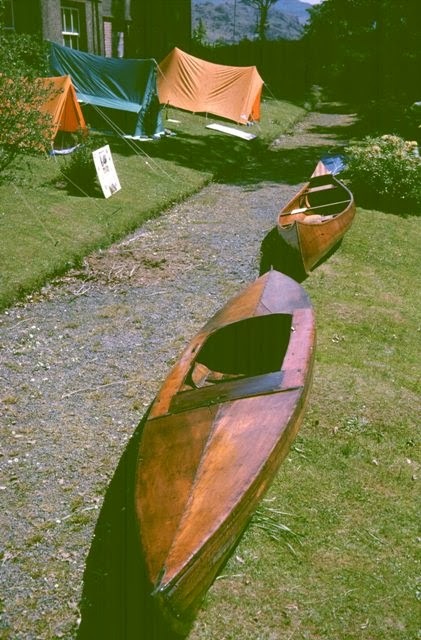 The original Rob Roy used by McGregor for his Orkney and Shetland trip was given to the New York Canoe Club in 1920 by McGregor’s widow through the connection of Pultney Bigelow who met the McGregors before his Danube trip. It has since been donated to the Mystic Seaport Watercraft Museum in Connecticut. And in 1975 the lines were drawn up. The Evangelist was an 1877 copy of this particular boat. Thanks to David Golightly for inspiring this search!